they are carcinogenic and have a long half life, while most the other hazardous wastes disappear during that time frame. 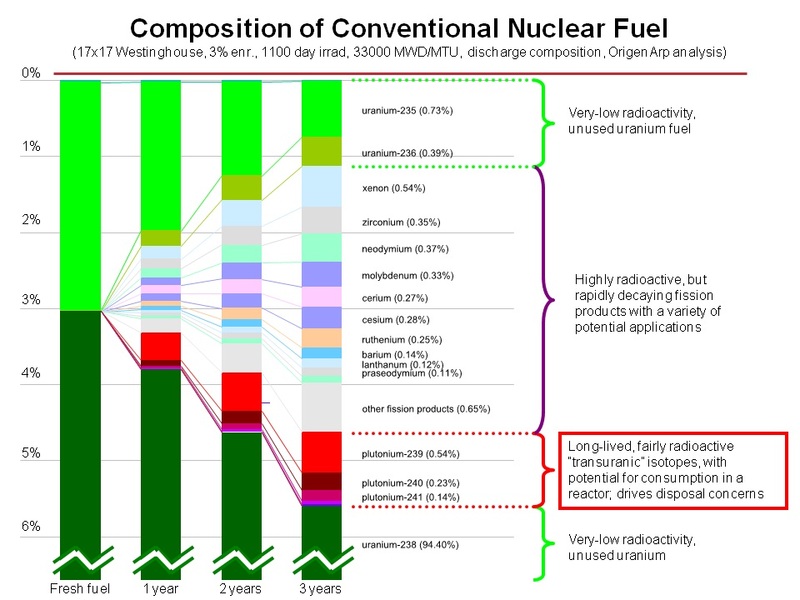 Usually, the fuel rod would be removed from the reactor in 18 - 36 months. The more troublesome waste is those left behind from the cold war era before 1991. 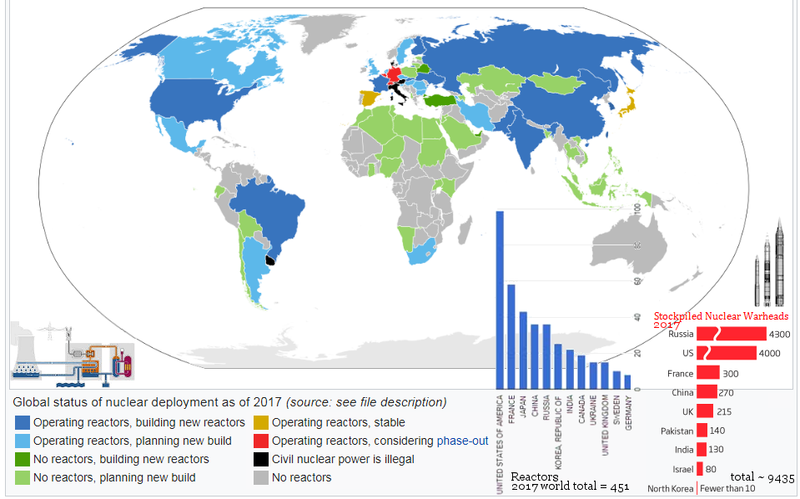 Figure 14-21 shows the 2017 inventory of nuclear warheads, the total of which is 10 times the number of reactors already. At the peak of cold war madness, there were about 125,000 warheads produced by the US and Soviet Union - enough to destroy the world many times over. Such waste has become a real problem for its disposal. 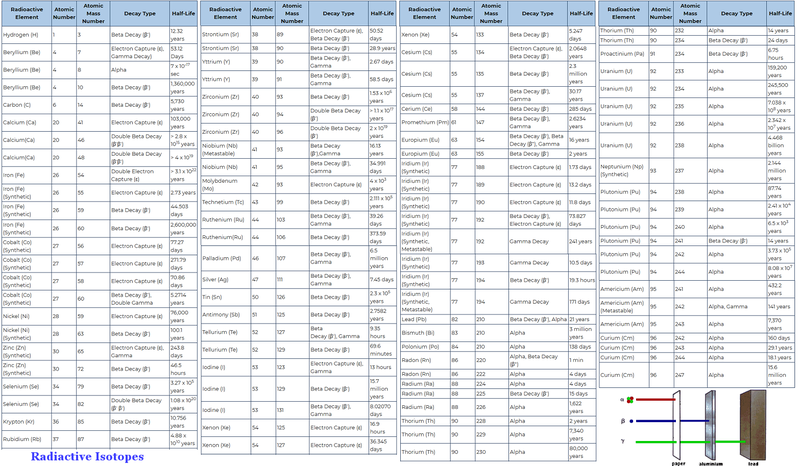 See a list of the "US Weapons Production Sites" etc. mixed waste because it contains both hazardous chemicals and radioactive materials. The cleanup effort is managed by the Department of Energy (DOE) with annual cost of 2 billion for another 20 years. As of 2017, the final goal of geological disposals has not been achieved. 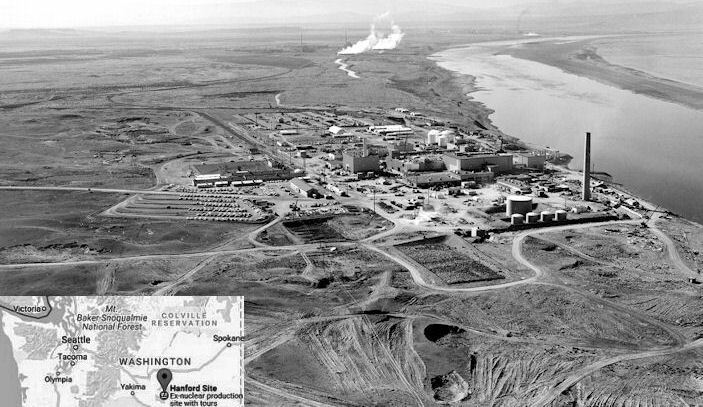 See "The Hanford Nuclear Site : A Legacy of Risk, Cost and Inefficiency"
There are various schemes to separate contents of the nuclear waste into classes. In general, it is characterized by the waste's radioactivity, half-life, source, and method of disposal. Figure 14-25 shows one of those classification schemes. The International Atomic Energy Agency (IAEA) has provided a set of more comprehensive Safety Standards which are summarized in the followings (also see Figure 14-26 for a visual review). Exempt Waste (EW) : Waste that meets the criteria for clearance, exemption or exclusion from regulatory control. Once the waste is admitted as such, it would not be considered as radioactive waste anymore. 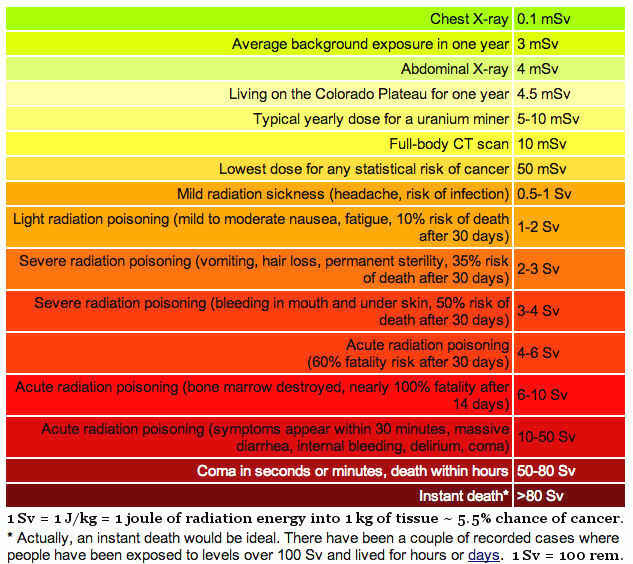 Radioactivity - It is within the clearance levels with radioactivity below the natural background of 3 mSv in one year (1 Sv = 1 J/kg of human tissue ~ 5.5% chance of developing cancer, see Figure 14-30). Half-life - The range is infinite as the natural background has very long half-life. Sources - It could be medical and research wastes, small quantities of radionuclides in effluents, and low concentrations of radium in soils. Very Short Lived Waste (VSLW) : This class contains only radionuclides (radioactive nuclei) of very short half-life. Radioactivity - Above clearance levels. Half-life - Very short in order of 100 days or less. Sources - It includes 192Ir and 99mTc (most commonly used medical radioisotope) and waste containing other radionuclides with short half-lives from industrial and medical applications. Disposal - In storage until the activity has fallen beneath the clearance levels allowing disposal as conventional waste. Very Low Level Waste (VLLW) : Waste that does not necessarily meet the criteria of EW, but that does not need a high level of containment and isolation and, therefore, is suitable for disposal in near surface landfill type facilities with limited regulatory control. Half-life - More than 100 days. Sources - Sources include waste from the operation and decommissioning of nuclear facilities, mining or processing of ores and minerals, soil and rubble with low levels radioactivity. Disposal - It is disposed in near surface landfill type facilities with limited regulatory control. Low Level Waste (LLW) : This class covers a very broad range of waste. LLW requires isolation and containment, but does not requires shielding in transport and storage (Figure 14-27). Radioactivity - Waste that generates less than 2 mSv/hr. This class may have a wide range of activity concentrations and may contain a wide range of radionuclides. Thus the method of disposal often depends on individual case. Sources - It may include short lived radionuclides at higher levels of activity concentration, and also long lived radionuclides, but only at relatively low levels of activity concentration. Thus, the kind of control should be related to the particular radionuclides in the waste. 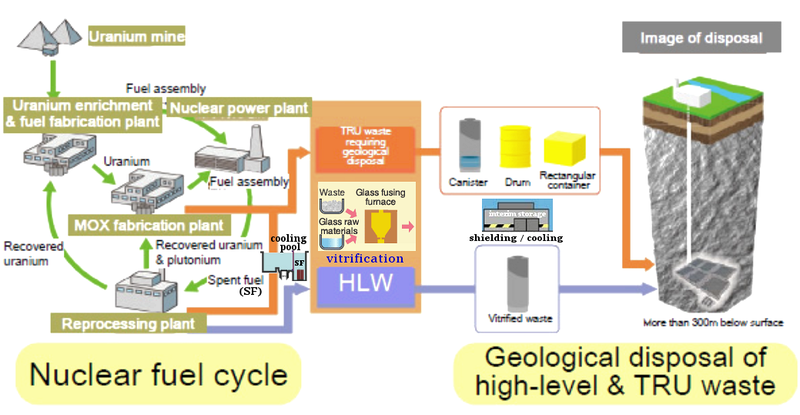 Disposal - It is suitable for disposal in engineered near surface facilities with depth down to 30 m.
See "Plasma-Arc Vitrification of Waste", also "Waste in Glass". Intermediate Level Waste (ILW) : This class needs no provision, or only limited provision, for cooling during its storage and disposal, but requires shielding. There is no precise boundary between LLW and ILW. Radioactivity - Waste that generates greater than 2 mSv/hr. Half-life - It contains long lived radionuclides, in particular, alpha emitting radionuclides, which is very harmful for its ionization power. 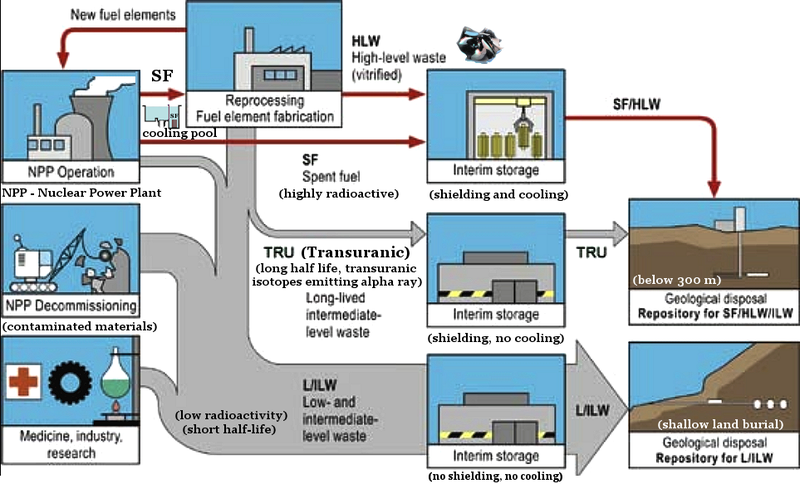 Sources - Waste from industrial applications (Figure 14-26), transuranic isotopes (TRU, Figure 14-25). Disposal - Waste in this class my require disposal at greater depths, of the order of tens of meters to a few hundred meters. High Level Waste (HLW) : Waste at this levels has activity concentration high enough to generate significant quantities of heat. Thus cooling is required for its storage (Figure 14-28). Radioactivity - HLW typically has levels of activity concentration in the range of 104 - 106 TBq/m3. Half-life - It is defined to be waste that contains large concentrations of both short and long lived radionuclides. Sources - Majority of source comes from spent fuel plus any other waste requiring a comparable degree of containment and isolation. Disposal - Following a few decades of cooling time, the generally recognized option is disposed in deep, stable geological formations, which is usually several hundred meters or more below the surface. 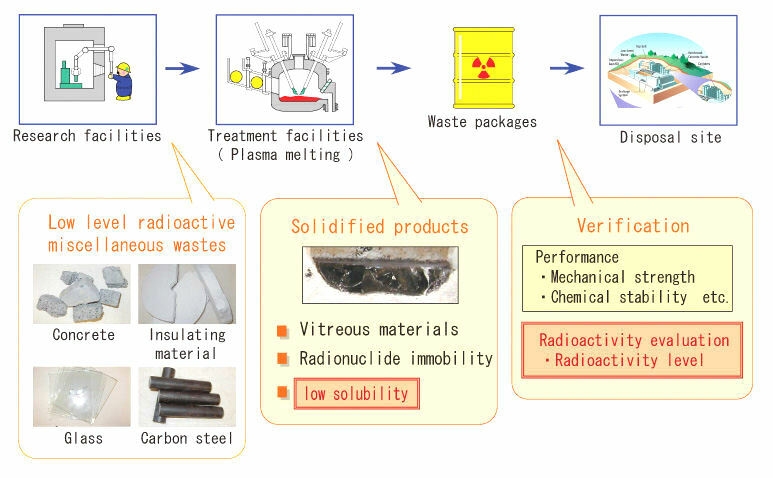 The decay mode of the radioactive isotope is closely related to the type of disposal of the waste. As shown in Figure 14-29 there is an optimal neutron to proton ratio for the existence of a stable nucleus. 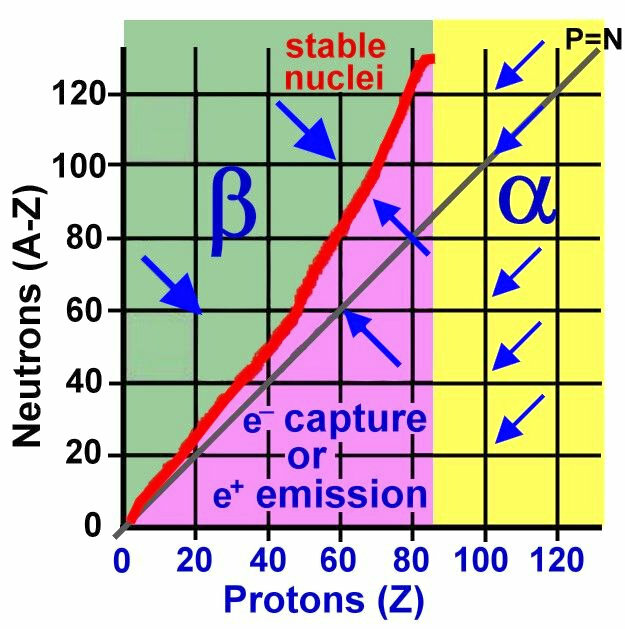 If a nucleus has too many neutron (high n/p ratio) the nucleus would undergo the beta decay process n p + e + e via the weak interaction to reduce to ratio. On the other hand, the e- capture process (the reverse beta process) p + e n + e would bump up the ratio when it is too low. 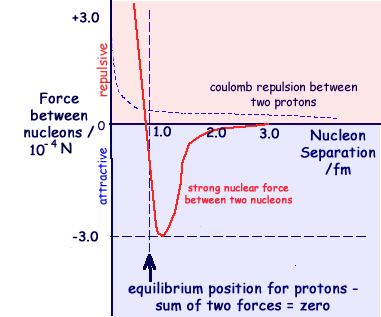 For heavy nucleus with Z > 82, the alpha decay through quantum tunnelling is the preferable mode to optimize the attractive strong interaction and the Coulomb repulsion. Gamma decay is the emission of high energy photons (see Table 14-05 below for more information about these decay modes). Table 14-06 is a list of radioactive isotopes from which the type of waste can be determined by the half life and decay mode.